Read the May 2016 edition of the Mathesis here. ATMNE has revised its constitution - the revisions need to be approved by each affiliate. Please review the revised Constitution and let NHTM Executive Board Members know if you approve or disapprove. Provide comments by May 26th, 2016 at noon. Congratulations to our newly elected NHTM Executive Board members: Natalie LaFlamme will assume the duties of Secretary in May 2016 and Sharon McCrone will serve as Post-Secondary Representative. Welcome aboard! Congratulations to STEPHANIE WHEELER our 2016 Richard H. Balomenos Memorial Awardee and STEFAN FRITZ the recipient of the 2016 Fernand J. Prevost Mathematics Teaching Award at our NHTM Annual Spring Conference held at Keene State College on March 18, 2016. It's less than 10 days away to our NHTM Annual Mathematics Conference. Do join us - Register by clicking on the 'register here' link on the Home page describing the Conference. You can also participate in the Exhibits Vote. The purpose of the ESANE ’ Vote Ballot’ is to give back to the organizations that we work with. All that is required is a name, title and email address from the voter. The rest of the requirement is to make sure that we reach their decision on their vote. In order to receive the grant money -- we need at least 50 votes from your organization to award the grant. No strings attached -- we do not sell your information to anyone!!! The February 2016 Mathesis has been posted and may be read here! Information about the 44th Annual NHTM - USNH NH State High School Mathematics Contest and the Registration Form is available here. Paying by invoice, download the invoice here. Still have questions email them to Stephen Latvis. Nominations are now open for positions of Secretary and Post-Secondary Representative on the NHTM Executive Board for SY 2016-2017. Electronic ballots will be sent to membership around January 15, 2016. Results will be announced at the NHTM Spring 2016 Mathematics Conference. NHTM needs assistance from our members. We are in the process of putting together two (2) Math conferences this year. 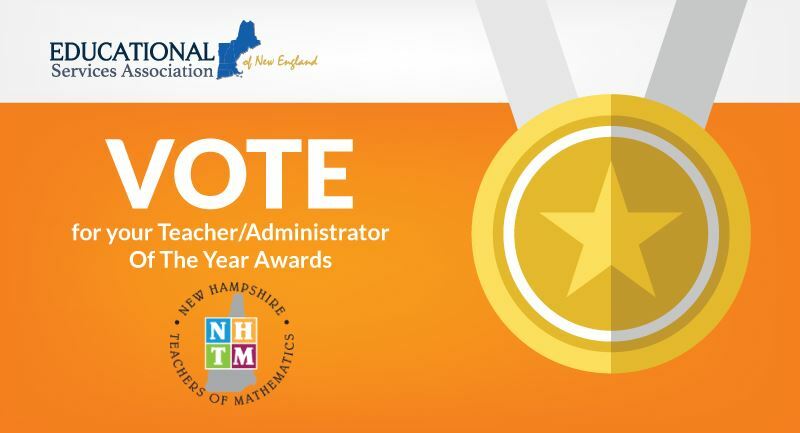 for the 2nd: NHTM is hosting ATMNE's Fall 2016 Mathematics Conference, "VOTE WITH MATH! DEVELOPING INFORMED CITIZENS THROUGH MATHEMATICS" on October 20-21, 2016 at the Radisson Hotel in Manchester NH. We need you - as Chars, Co-chairs, and/or volunteers on various committees. Please review the following areas and if you can, please respond to this 'Call for Volunteers' as soon as possible. We will need to hold organizational meetings soon!